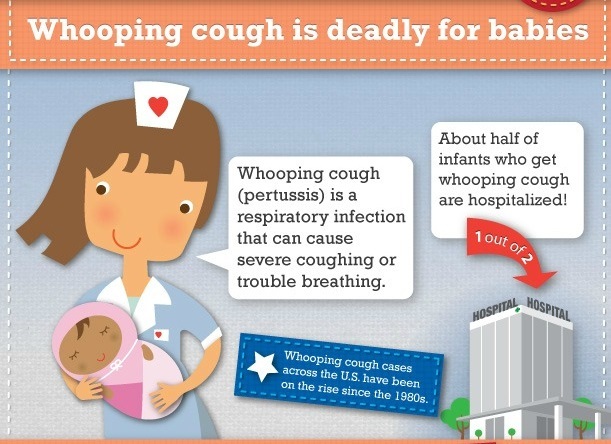 Infographic about whooping cough risks for babies. Update of an article published on 7 September 2012. Over the past few months I have written extensively about several whooping cough (Bordetella pertussis) outbreaks which had reached epidemic levels in areas like the Washington state, and has been considered one of the worst outbreaks in the USA during the past several decades. The outbreak has lead to several deaths here in the USA and in other countries such as the UK. Of course, these outbreaks and epidemics have lead to the “blame game” from the antivaccination gang, because they have claimed that since A) most kids are vaccinated, and B) we’re having this outbreak then C) either the vaccines are useless or are actually the cause of the outbreak. Seriously. They blame the vaccines. So I decided to search the internet to find the most popular vaccine denialist arguments regarding pertussis vaccinations, and deconstruct and debunk them. Hopefully, it will be a useful tool for you when you’re engaging a ridiculous argument with one of those antivaccinationists. Of course, I could use the information too. Let’s make this clear as possible–this study is completely and intentionally misinterpreted by Mercola. In fact, the vaccine still works, but the immunity from it wanes sooner than expected, and that this area of California doesn’t have a high enough rate of vaccination to prevent epidemics. Moreover, the authors of the study recommend that the CDC and FDA should change the vaccination schedule to provide earlier boosters to protect older children and teenagers (and I would contend adults). This is how science works, get the evidence, revise the hypothesis, and retest the hypothesis, then come to a new and improved scientific consensus. …Mercola (claims) that vaccines are “causing dangerous mutations.” While it is possible that the B. pertussis bacteria is developing “resistance” to the vaccine through natural selection, the evidence that it is doing so strikes me as rather weak and preliminary. Even if it were, the answer would be to change the vaccine in order to include the altered antigens. After all, do we decide that antibiotics don’t work when bacteria evolve resistance or that chemotherapy doesn’t work when tumors manage to do the same? That’s a rhetorical question, of course. Some segments of the alt-med world do, but reasonable scientists do not. They work to overcome that resistance. Finally, we should consider the potential contribution of genetic changes in circulating strains of B. pertussis. It is clear that genetic changes have occurred over time in three B. pertussis antigens — pertussis toxin, pertactin, and fimbriae. In fact, changes in fimbrial agglutinogens related to vaccine use were noted about 50 years ago. Studies in the Netherlands and Australia have suggested that genetic changes have led to vaccine failures, but many people question these findings. If genetic changes had increased the rates of vaccine failure, one would expect to see those effects first in Denmark, which has for the past 15 years used a vaccine with a single pertussis antigen (pertussis toxin toxoid). To date, however, there is no evidence of increased vaccine failure in Denmark. There’s one more thing that the vaccination denialists fail to mention. Vaccines work. 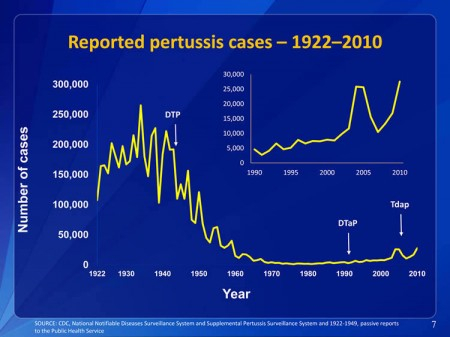 This graph illustrates the absolute number of pertussis cases in the USA, which shows a dramatic drop since the introduction of the pertussis vaccine in the mid-40’s. If this graph was converted into per capita, accounting for the nearly 2.5X increase of US population from the 1930’s, the drop would be even more dramatic. In other words, even with the what the antivaccinationists claim as a “bad vaccine”, pertussis is just about wiped out compared to what it was just 70 or 80 years ago. But, as you can see, the slight increase recently means that we have to vigilant, and we have to do some adjustments to the vaccine. Medicine does that all the time. I’m pretty certain that cancer therapies have evolved from 1930 to 2012. And that’s a good thing. 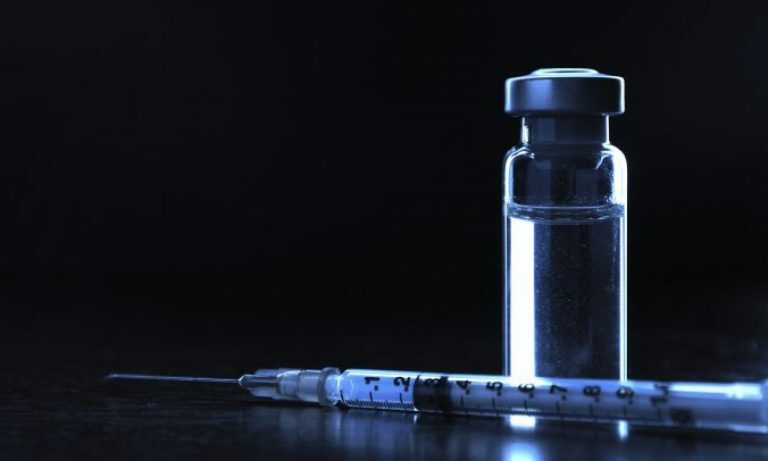 Previous PostPrevious Crowd funded HIV vaccine–junk science?